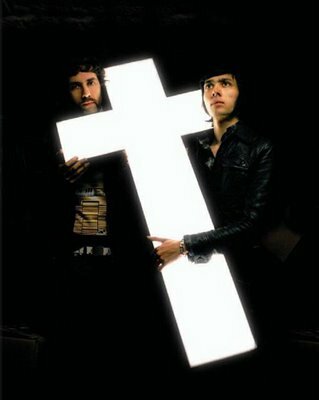 I was doing my usual Hype Machine browsing this morning and came a cross a “new” Justice track, “Beginning of the End.” Before I even hit the play button I was like, “yeah right…” As much as I would love to hear a new and real Justice track, it just doesn’t seem to be written in the stars. Seems to me like just another ploy of some unknown goon trying to get a rise out of people. And rightfully so, Justice is a dope as dope itself. Their silence is unfortunate and any fan out there is dying to hear anything new. This isn’t the first attempt of someone put out a fake Justice track. Back in the summer of 2008, Keedz put out the track “Stand On The World” and it was rumored that the track was indeed produced by Justice. This is the only track to appear by Keedz and whether or not it is actually Justice has never been determined – it doesn’t really matter. And almost a year ago in early 2009 a radio rip of “We Kids” appeared on the interwebs via BBC. Being claimed by many to be yet another Justice produced track, it clearly is not. A lot can be said about Justice with the fact that there are people out there trying to make music under their name. Although all these fake Justice tracks are most likely not genuine Justice, it’s fun to hope they are and even more fun to listen to. While we all impatiently wait for some real Justice music to surface, take the faux Justice tracks that everyone is clamoring over. Enjoy them as if they are Justice, even though they most likely are not.